If he ever gets control of struggling computer maker Dell, billionaire investor Carl Icahn essentially said he plans to fire its founding CEO, Michael Dell. Taking to CNBC’s airwaves in another one of his candid phoned-in afternoon rants (the last was an epic 28-minute on-air slugfest with hedge fund investor Bill Ackman in January) with host Scott Wapner during the closing half hour or so of the network’s “Fast Money Halftime Report” show, Icahn revealed that on Monday he will nominate a slate of 12 new directors and, if successful, he’ll see to it that Michael Dell doesn’t remain CEO. 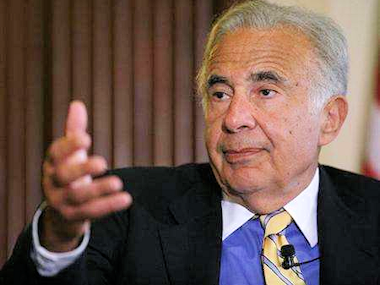 “He will not be running the company,” Icahn said. The special committee of Dell’s board has in the last several minutes issued a statement saying it is “carefully reviewing” the Icahn-Southeastern offer. In his televised jeremiad, Icahn blasted Dell’s board and said that Dell shareholders will “literally get screwed” by the $24.4 billion Michael Dell/Silver Lake offer to take the company private in a leveraged buyout. His offer, he said, would leave existing shareholders with a publicly traded stub that would allow them to make more money than the $13.65 per share Dell and Silver Lake have offered. Below, two video highlights. The second one focuses more on Wapner’s fascination with Icahn’s opinion of the legendary Wall Street short-seller Jim Chanos, who has previously publicly stated that he has been shorting Dell shares. “I’ve made a lot of money going against Chanos,” Icahn said. Of course it goes without saying that all the attention on Dell caused the shares to trade upward during the half hour or so that Icahn was on CNBC. Ahead of 1 pm ET, Dell shares were trading as high as $13.51, or up more than 1 percent. After Icahn hung up (and apparently called BloombergTV to make a similar on-air speech), its price settled back down. 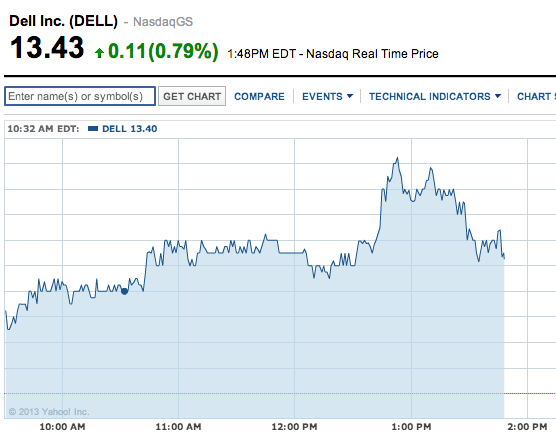 Here’s a screen grab I took of Dell’s share price via Yahoo Finance.